Greece’s left-wing government has made several concessions to the country’s lenders in an updated reform plan that aims to break a five-month deadlock over a new €7.2 billion austerity deal – and stave off bankruptcy. "We have made concessions, because a negotiation demands concessions, we know these concessions will be difficult… Last night a complete plan was submitted... a realistic plan to take the country out of the crisis," Greek Prime Minister Alexis Tsipras said Tuesday. The sides have failed to reach a deal on vital issues as the labor market and the pension system, while making progress on value-added tax reform. 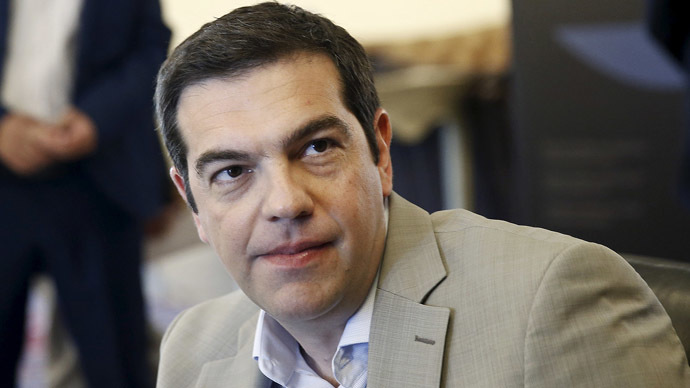 Greek government reportedly submitted a 46-page draft agreement to lenders Monday, a source in Athens told AFP. Tsipras spoke amid speculation that Greece was about to receive an ultimatum from its lenders after five months of stalemate. "I am confident, I believe the political leadership of Europe will approach our positions with respect and join the side of realism," the Greek leader said. The possible thaw in negotiations is connected to the IMF repayment deadline on June 5. Athens has to repay the lender over €300 million, the first of four tranches totaling €1.6 billion euro due in June. Greece will be able to pay the €300 million, scraping the cash together from internal resources, Greek Economy Minister George Stathakis said last week. However, it is not yet known how heavy a price the Greek people will have to pay to avoid a government debt default. Last time the government had to pay €750 million, which fell due in May. It managed to pay only by emptying an emergency IMF holding account. It’s not the first attempt by Greece to agree a reform plan with international creditors. In April, Athens presented a 26-page plan that was criticized by lenders for lacking concrete proposals. The two parties failed to reach a compromise, as Greece says it won’t accept sharp budget cuts, known as the austerity policy, while the creditors want their money back and insist that Greece reform its finances. There are serious worries that Greece could default, ending up leaving the Eurozone. Last week, IMF Managing Director Christine Lagarde said a Grexit was possible. Later, a spokesman for IMF said her words were misinterpreted. On Sunday, Tsipras expressed his country’s wish to stay within the euro on his website, but he also accused European lenders of making “absurd proposals” and being indifferent to the Greek people’s fate.